Orion Aerospace is a precision metal fabricator for industries including aerospace, defense, marine, and automotive. The Washington-based company specializes in CNC machining, mechanical and hydraulic assembly services, and kitting. The company was founded half a century ago as a training center for sheet metal workers, and it continues to provide job training in addition to high-quality products for its customers, including Boeing. Orion is a Lean manufacturing facility that focuses on quality and on-time delivery to satisfy its customers. The company recently held an Accelerated Improvement Workshop (AIW) in its grommet and deburr cell to improve organization and make the space easier to navigate. To achieve higher levels of order in this area, participants in the AIW used visual tools including floor marking tape, a LabelTac® industrial label printer, and foam tool kits. Using floor marking tape, they created borders on the floor around desks, racks, and tables to mark where furniture should go. Different colors were used to highlight different areas. This technique was especially helpful for racks with wheels, which occasionally move from their proper locations. With the help of a LabelTac® industrial label printer, the team also organized work in process (WIP) in a clearer way. The new system includes shelf labels and clearly marked bins with color-coded labels so workers can quickly identify the contents of each container. Finally, Orion also organized hand tools such as scissors and screwdrivers using foam tool kits. Previously, these items had been stored in bins. Now they’re stored in drawers and held in place with tool foam. This keeps the tools from getting damaged. When a tool is missing, it’s also very apparent because the kit’s bright yellow bottom layer highlights its absence. 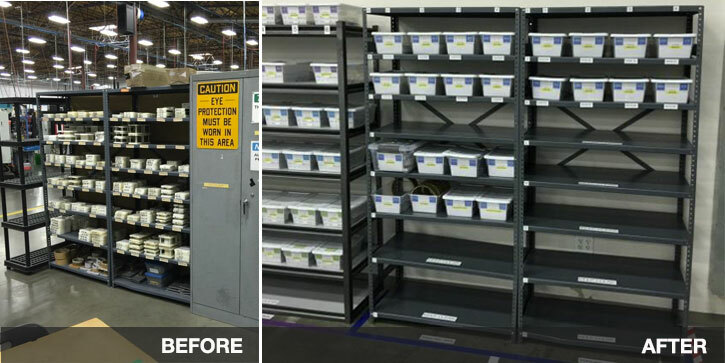 Combined, these visual techniques have made it easier for Orion Aerospace employees to find the materials and tools they need, keep the workspace organized, and perform their tasks efficiently at the grommet and deburr cell.